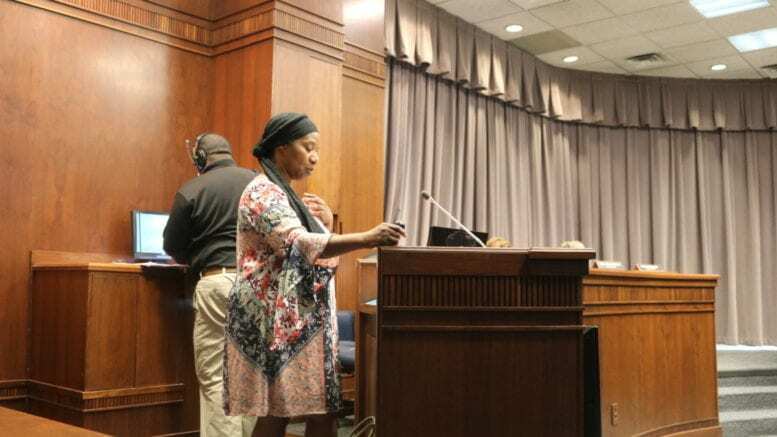 After an impassioned presentation from Cobb homeowner Cecile Ferguson, the Cobb County Board of Commissioners approved a Land Use Permit for four backyard chickens on her 0.76-acre lot. The chickens will serve as therapy animals for her son Josiah, who has autism. The property is on Blackwell Road. Ferguson said her son, in addition to autism, was also diagnosed with ADHD, anxiety, and a number of other behavioral disorders. She said that through research she had come across an article about the benefits of animal therapy for children with autism in helping develop social skills, improve communication, and help with behavioral issues. She said District 3 Commissioner JoAnn Birrell had visited her house recently and walked her property. Ferguson lives in Birrell’s district and Birrell has been one of the commissioners most often opposed to backyard chickens. “And I cannot (as) a parent or property owner express how off-putting that was and upsetting to me, because I felt helpless but for God, for prayer,” she said. The motion passed 4-0 (Commissioner Bob Ott was absent). The BOC denied the request for goats and sheep but waived the fee should Ferguson decide to reapply for those animals next year. Ferguson told the Courier after the vote that one of her frustrations was that she thought commercial developers get more consideration when applying for variances and permits than individuals like her. Joseph Pond responded to the case on the Facebook group of the Backyard Chickens Alliance of Cobb County. Pond is a candidate for the Cobb County Board of Commissioners in Birrell’s district and an advocate for the right of county residents to have backyard chickens.